Established in 1980, Galerie de Bellefeuille represents many of Canada's top contemporary artists as well as a select international list such as Jim Dine, Stephen Conroy and Nicola Hicks. Spanning an area of 5,000 square feet, there is a superb selection of sculptures, paintings and limited edition prints. Open since 1989, Galerie Simon Blais specializes in Canadian and European abstract art, with an inventory consisting mostly of works on paper and on canvas, as well as prints and sculptures. 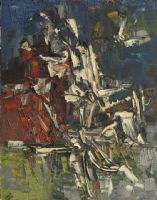 We hold between 6 and 10 solo exhibitions each year with either young contemporary artists from our stable or with major painters and sculptors that have contributed to Canada's an Québec's art history since 1945 (Riopelle, Ferron, Daudelin, McEwen, Gaucher, Letendre, etc) . Prints represent a special interest for us, with a focus on international abstraction, and on avant-garde figuration by leading Québec artists (Riopelle, Derouin, Vincent, Whitthome), as well as French (Debré, Zao Wou-Ki, Friedlaender), and Spanish printmakers (Tapies, Miro, Monir). Photographs are also part of the gallery's regular inventory with a select group of Québec photographers (Clément, Carrière) and the startling French photographer Bernard Pras who creates trompe-l'oeil compositions with assemblages of objects. Simon Blais is a member of the board of the AGAC (Contemporary Art Galleries Association of Montréal), and an associate member of PADAC, Professional Art Dealers Association of Canada. Welcome to Galerie Desja !! We invite you to visit us on your next trip to Montreal. We are strategically located in the heart of the gallery row in Old Montreal; one block only from the Basilica and in close proximity to wonderful restaurants and hotels. It's our aim to make you feel welcome to browse and visit the gallery in the most comfortable and pleasant environment as possible. We have chosen to offer Quebec artists that paint in a variety of styles, contemporary would best describe them. 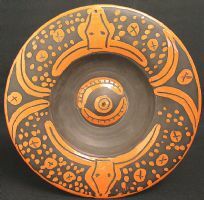 We also offer interesting raku pottery as well as bronze sculptures. Customized services are available to meet all your needs; this includes shipping all over the world as well as special commissions. First and foremost, we want your visit to be a memorable one in our city; visiting our gallery and the sector we are part of should be part of that experience. Located near the Montreal Fine Arts Museum on prestigious Sherbrooke Street West, in Montreal Canada, Galerie Berensen, a division of Berensen Fine Arts Consultants Inc., is housed in an early 20th century building. We maintain an active exhibition program in a 5 000 sq. feet showroom, one of the finest exhibition spaces in Montreal. Galerie Berensen specializes in paintings, works on paper, sculpture and photographs by modern and contemporary Canadian and International artists. We also maintain a large inventory of paintings by 20th century European masters and 19th century and impressionist European art. Furthermore, with decades of experience in dealing in Russian art, as well as Greek and Russian Icons, our knowledge is unsurpassed. We are regularly consulted by collectors, dealers and auction houses for our expertise. We are proud to have placed over the years important works of art in private and public collections.